Is this a Helmet Orchid Bud? When I was taking the photograph, the bud was too small to see clearly. it looked like a speck of colour. I’m calling on my knowledgeable friends here. Thanks to some extremely helpful advice from Mary McAvoy (see her blog here) I was able to photograph this tiny orchid reasonably clearly. I’m not sure, but I think it may be a Helmet Orchid. Can anyone verify this? 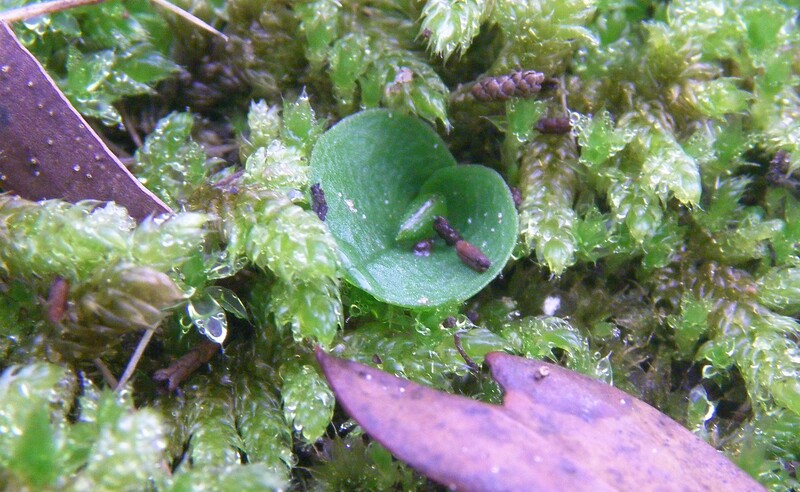 The leaves are the same size as the Small Mosquito Orchid, but seem to be a different colour, and have a swirled appearance which is different to the heart shape of the Small Mosquito Orchid leaves. From what I can see, the flower bud seems to have the shiny purplish surface on the back of the labellum, but as it has not fully emerged yet, it is difficult to tell the final appearance of the flower. I’m trying to match this against photographs online and in books, but so far, I can’t see a leaf resembling this one, so I’m really not sure what it may be. If you can help, please leave a comment below. I’d really appreciate it. There is a patch of these plants in a distinct location separated from the Small Mosquito Orchids, which are growing in many different zones. This is not a Helmet orchid but instead Cyrtostylis reniformis, the Gnat Orchid. For some reason I have not covered this particular species on OrchidNotes. However here is a link referring to the sister species of the one you have. They pretty much look the same, but have different flowering times and slightly different leaves as you can see in the pictures on my post. Yours will probably flower from August to early October. Hope that helps. Thanks for the information. That means I still don’t know what the Helmet orchids look like…. I’ll keep searching! Often you will find these at the base of gum trees and in leaf litter. 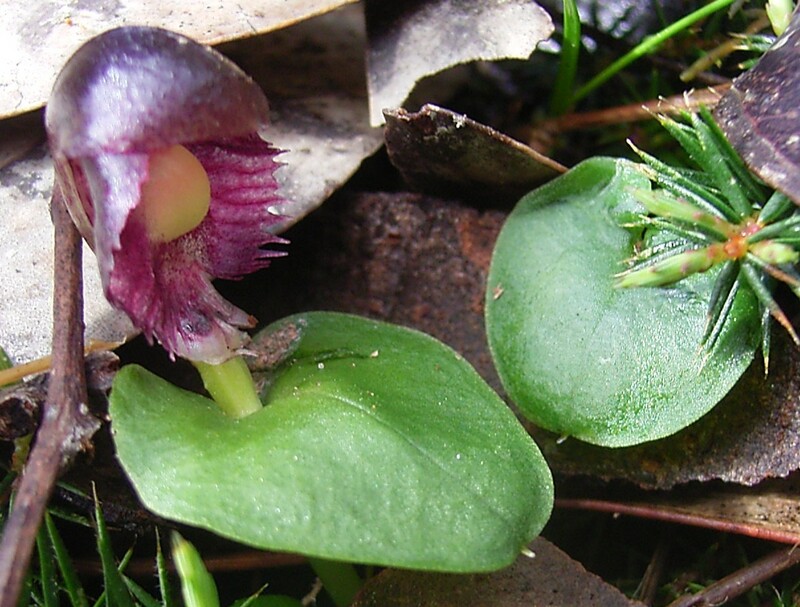 The leaves sit close to the ground, similarly to the Gnat orchid – whereas the mosquito orchid leaves sit off the ground. Also the underside of the helmet orchid leaves are green. Hopefully you will find some soon! Thanks for the links to these photos, Helen. It will help to know what I am looking for. The ground is literally covered with tiny round green leaves, and the skill is to be able to tell the difference between the various species. Something at which I am very much a beginner. In the past week, by researching the Small Mosquito Orchid, I have learned that these Orchid leaves do sit off the ground. I took some photos of this the other day, and will be putting up a second post on Small Mosquito Orchids soon. Thanks again for your help on this one.